Change / copy Volume Serial number. WinKeyFinder is free and portable. The Magical Jelly Bean Keyfinder is a freeware open source utility that retrieves your Product Key (cd key) used to install Windows from your registry. It allows you to print or save your keys for safekeeping. It works on Windows 95, 98, ME, 2000, XP, Vista, Server 2003, Server 2008, Office XP, Office 2003, and Office 2007 family of products. It also has a community-updated configuration file that retrieves product keys for many other applications. Another feature is the ability to retrieve product keys from unbootable Windows installations. Unfortunately, unless you have license documentation microsofts point of view will be that you're not licensed regardless of what codes you have. Generally unless you have the certificate or some sort of evidence of a license transfer you don't have a license. See this article : "Top 13 Free Product Key Finder Programs". One or more of them should answer all your needs. Not the answer you're looking for? Browse other questions tagged windows-xp license license-key or ask your own question. How to extract license information from AutoCAD? Microsoft Office 2007 license self-audit? 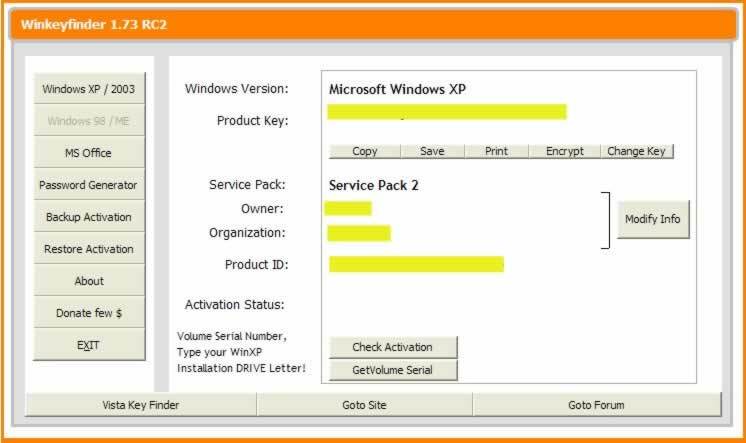 Retrieve license key from Windows 8 Enterprise? How to enable the WMI service on many machines to find MS-Office licenses using the Volume Activation Management Tool 2.0 using Active Directory? Windows 7 product key, which is the valid one - in registry or on a sticker?